It's time to announce the giveaway for March here at Chic & Green™. There's a great company out there called Naturity and they can be found right over at the EWG's Skin Deep Cosmetics Database with a hazard score of zero for each and every one of their products. A score of zero is the best at this site because it means their products do not contain toxic ingredients and are considered to be completely safe. 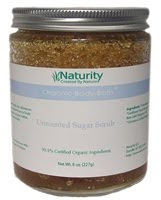 Founded by Anysia Kiel, Naturity also uses 99-100% certified organic ingredients in their creations. The kind folks at Naturity sent me two products to try out recently: the Rosemary Sugar Scrub and a jar of their Lavender bath salts. I enjoyed the bath product immensely and was able to soak away my cares while softening my skin at the same time. The calming lavender essential oil was so soothing after a long and hectic day. I would like to share what Naturity sent me with one lucky Chic & Green™ reader this month. Congratulations to Mary Beth L. and Eve S., who each won a bareMinerals from Bare Escentuals 100% Natural Lip Gloss in last month's drawing. Disclosure: I did not receive compensation for talking about this company. I did not pay for this scrub. It was sent to me by Naturity. That in no way has influenced my feelings and the opinions expressed are my own.